With the cooler weather here it is a good idea to put in the entrance reducers. The cooler weather will have the bees clustering in the hive. In a three deep hive the bees will be mostly in the middle box. So not many bees in the bottom box. Mice are looking for a place to stay for the winter. Entrance reducers will keep them out of the hive. Entrance reducers should be placed at the larger opening. It was a nice day yesterday. The bees were very friendly and not crabby at all. Most of my colonies had very strong populations of bees. Several colonies were a little lite on food. I fed most of the colonies some ProSweet using hive top feeders. All of the feed had ProHealth mixed into the syrup, this can help keep down the Nosema spores in the bees gut. Nosema are spores that can build up in the gut of the bee. High spore levels can bring out diarrhea in the colony and can lead to colony death usually in late winter. So keeping the spores at a lower level is a priority. Hive top feeders hold about 4 gallons of syrup. 4 gallons of ProSweet, that is about 46 lbs of food or about 5 deep frames worth of honey. I wanted to make sure that the colonies are heavy with winter stores going into fall. The up coming winter is supposed to have below average temperatures with average snowfall. Having heavy colonies going into the winter and strong populations is the key for wintering success. The colonies have been treated for mites using Hopguard II. The weather will be perfect for feeding for the next week. Beekeepers need to take advantage of this summer like weather for the bees to easily put down syrup into the hive. As it cools down the bees become more reluctant to take down the syrup. Beekeepers have been treating for mites and feeding their bees right now. Getting enough food in the hive is working so far with the nice weather we have been experiencing. The bees have been sucking down the feed. Putting multiple feeder pails on the hive at once helps get the feed in faster. Robbing has been an issue for some beekeepers. Putting in entrance reducers at the large opening and plugging all the holes has been keeping robbers out of the colonies. Mite treatments have benefited with the warm weather. Mite away kwik strips and Hopguard II strips have been the choice of many beekeepers now in late summer. Still to early to put on winter covers look for around anytime after Nov 1st. Right now what should a typical hive look like. Now is crunch time for beehives. The honey supers should be off and if mite treatments need to be put on, should go on now. A hive going into winter needs to have minimum 8 frames of bees. This means if you looked at your hive on a cooler day like the cool days coming up later in the week, you should have bees covering the both sides of 8 deep frames. The queen in the hive should have never gone through a winter. An old queen can fail during the winter and cause the colony to perish. There should be enough honey for winter stores. The right amount is 8 full frames of honey and one partially full in the top box. The box underneath the top box, should have 4 full frames of honey in the box. Preferably two frames on either side of the box. This is the minimum size of a hive going into winter. If you don't have that much honey, feeding now is the plan. I talked to a lady today that said she had a lot of bees but very little honey. I gave here this advice. The odds of getting 100 lbs in the hive at this stage of the season is very unlikely. The best thing to do on any marginal colonies is to depopulate them and start new packages in the fall. The expense to try to save something that is marginal doesn't make economic sense. She could try to feed them and spend $80.00 on feed. If they die anyway and eat up most of the feed, she would have been money ahead buying a package in the spring. Hindsight here is if she would have realized a month ago that her hives were light on honey she would have had time to get that amount in them. Take your loss in the fall. Make a plan for spring now on what hives that will need to be replaced. This is a link to the NY times about research done and tracking foraging workers. Robbing can be very serious. If it gets started it is hard to stop. I had a beekeeper rent an extractor today to extract his honey crop. When he went to pull his honey he found his colonies dead and empty. The two hives were overcome by bees, wasps, and hornets. The frenzy starts and it doesn't stop until there is nothing left. The beekeeper found his bottom board covered with dead bees and capping wax from the honey frames that are now all empty. How does this happen? The most common way is beekeepers put their wet extracted supers out by their hives for the bees to clean up. What can happen is the bees finish with the supers, then turn on the first hive in the beeyard. A whole beeyard can get wiped out by this robbing. Preventing this can be as simple as putting in entrance reducers now with the largest opening open, If it appears robbing is happening, closing to the smaller opening can help, sometime the entrances have to be closed to stop the feeding frenzy. If a beekeeper has wet supers to clean up, it works best to put the supers on top of the inner cover and put the telescoping cover on top of the supers. Make sure the cover is on tight with a brick on it. This keeps the bees from sneaking in the top. The supers should be picked clean in three or four days, They can be removed an properly stored. Colder weather moving in - will it stay? There is a big chunk of cold weather moving in late next week. The question is will it stay cold? What will work, what won't work when it cools off. Right now today Miteaway qwik strips will work for Varroa control. It is a seven day treatment so treating today will be the best choice. If the temperatures stay in the 60's Miteaway qwik strips and Apiguard will no longer be effective. This is why treating in August is best when using these products that are temperature dependent. The two products that work all the time, because they are contact strips, are Hopguard II and Apivar. Feeding, if hives are light on winter stores feeding should be done immediately. I will say that ProSweet in my opinion is superior to 2:1 sugar water. The bees pack the ProSweet away in the frames and don't have to do anything else. ProSweet has fructose and sucrose in it, just like honey. Feeding 2:1 sugar water the bees have to turn it into honey and dehumidify it. This takes time. As it cools of in the fall, bees become reluctant to take down syrup because the syrup is cool and they don't like cold syrup. Bees on a warm day will empty a feeder pail in three days. So if feeding, stay on it. A beekeeper can fit three feeder pails directly on top of the frames this time of year. Cover the pails with an empty deep and the inner cover and telescoping cover. Still no hurry to cover with winter covers. Wait at least until late October. So lets all hope for a long fall warm up. The farmers almanac speculates snow showers in the metro area in the third week of October. As we head into Sept, now is the time to make sure enough there is enough food in the hive. Right now the heaviest box of honey should be the top box. The top box should have at least 8 full frames of honey. The next box below this should have four full frames of honey. If the hive doesn't have this amount of honey feeding should be started immediately. As the weather starts to cool the bees become more reluctant to take feed. The risk of not having enough food in the hive becomes greater. Whenever bees are fed, it is considered a nectar flow. A nectar flow encourages the queen to lay eggs and make more brood. Feeding late will keep brood in the hive for another month after the feeding stops. If a beekeeper feeds into mid October to early November, brood may be in the hive into December. The colony will have to eat more of their winter stores to feed the brood and keep it warm. This increased honey consumption can lead to colony starvation in late winter. The bees right now will take the honey down quickly because there are many more bees in the hive than when most of us were feeding in the spring. Feeder pails will be emptied in about 3 days because of the higher bee numbers. Fall feeding is heavy syrup or 2 parts sugar to 1 part water, or feed ProSweet syrup. Feeding heavy syrup the bees have to take it down and dehumidify to turn it into honey. 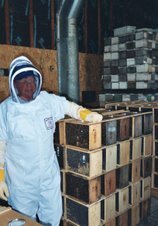 The advantage of ProSweet is the bees don't have to turn it into honey, the bees take it down and store it in the frames and they are done. Adding ProHealth or some other equivalent to any syrup will also help keep down Nosema spores in the bees gut. Nosema is a stress disease that bees can get in late winter and can kill a colony. It is recommended that all colonies are fed two gallons of treated syrup in the fall. 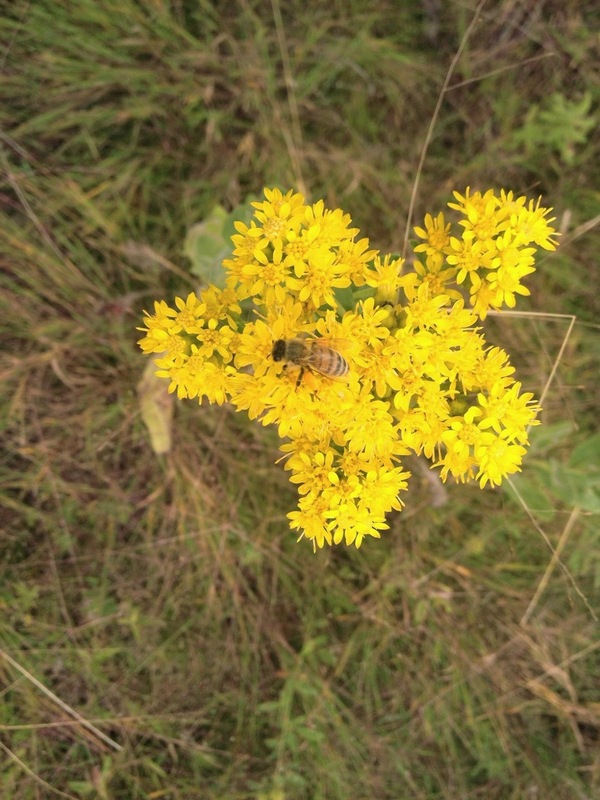 Some beekeepers have been getting some Goldenrod honey. The flow is spotty and not everyone is getting some of the nectar. There are a few varieties of Goldenrod and some varieties seem to produce more than others. 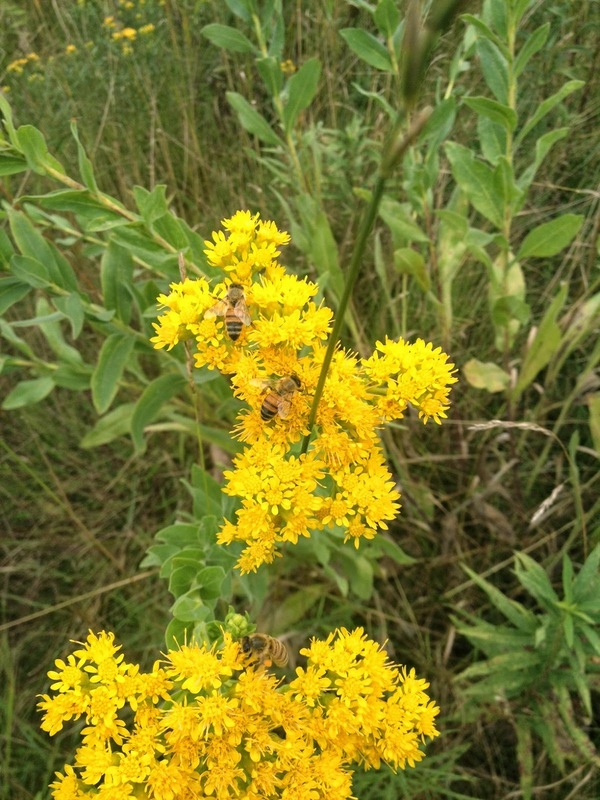 Right now in my area the bees seem to be on the Stiff Goldenrod and not so much on the Canada Goldenrod.